Since the mid-20th century, two kinds of Mexican diet have been diverging from one another. One is deeply traditional—think tamales, atoles, pinoles, moles, tepaches, caldos, and nopalitos—while the other is industrially processed and globalized, high in saturated fats, fiber-free flours, and sugars, and low in protein. This is true whether we are in the metropolitan markets of Mexico City, the tropics of Yucatán, or the arid borderlands of the north. And yet, there is enormous interest in the healthful variants that undergird the entire range of Mexican traditions, if only because so many Mexican-Americans in the United States are suffering from the harms perpetuated by industrialized fast-food versions of this diet. According to research by the World Health Organization in 2012, Mexico surpassed the United States (and all other countries) for the most obese people per capita. This crisis has prompted Mexico’s activist-scholars to initiate a thorough and far-reaching effort to return to the original structure and composition of a traditional diet. It is their hope that the reappraisal and revival of a Mesoamerican diet will soon begin to reduce the number of people suffering from nutrition-related diseases not only in the tropical heartland of Mexico but also in the arid reaches of the U.S./Mexico borderlands. A vendor in a Merida, Yucatan, market sells a traditional Mayan lima bean roasted in embers and hot stones. 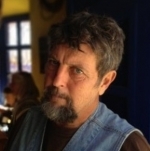 Among those activist-scholars are crop geographers and ethnobotanists Daniel Zizumbo and Patricia Colunga of CICY, the Center for Scientific Research in Yucatán. 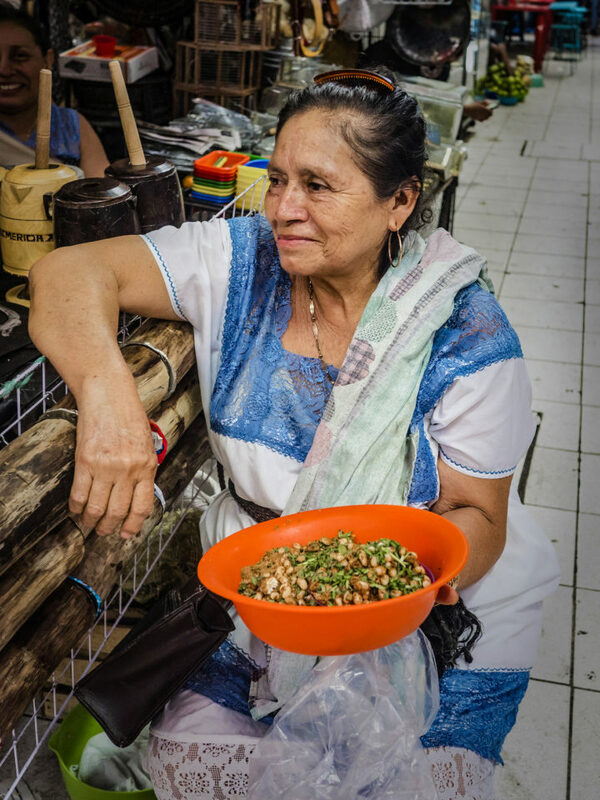 They are among the researchers of the Mesoamerican diet exploring how obesity and diabetes ever gained such a strong foothold in a country that is internationally celebrated for its food diversity. The problem, they say, is the deviation from a set of diverse food preparation and cooking traditions that have served indigenous Americans well for more than 10,000 years. These time-tried preparation and cooking strategies include nixtamalization, or adding alkaline sources like ashes to soften corn kernels, cooking on red hot stones, toasting or popping seeds, pit roasting or steaming meats and vegetables, and “cold cooking” of shellfish in acidic fruit juices and vinegars as ceviches. Colunga and Zizumbo are alarmed at historic declines in the consumption of legumes, nutritious pseudocereals like amaranth, chia, huazontle, diverse leafy greens, many succulents like cacti and agaves, and the beneficial microbes in fermented traditional foods and beverages. But they are optimistic that these cooking techniques and diverse foods can return to Mexican hearths and tables. Their findings suggest that Mesoamerican cultures developed traditional cuisines that were not only extraordinarily diverse in their food species but in preparation techniques as well. But as Colunga and Zizumbo are careful to state, their work is not about a single “miracle food,” but about a “diverse agricultural ecosystem that sustainably generated a balanced diet by combining both wild and domesticated foodstuffs” through healthful preparation techniques. You can’t just eat a few of the foodstuffs prepared with modern kitchen utensils and expect the same results. Direct engagement in cultivating a diverse milpa ecosystem—not just eating a few of its seed crops in a reductionist manner—is part of their message. Their shorthand summary—the future should build on the ancestral—does not mean that we should literally copy the ways that the Mesoamerican diet was once implemented. Instead, we must work on combining these ingredients in a variety of preparation techniques to capture their synergies. Archaeologists and linguists have surmised that some orally transmitted recipes in Mesoamerica may reach back as far as 10,500 years. As such, UNESCO has recognized the Mesoamerican diet as a source of intangible cultural heritage, or patrimonio cultural, of global significance. That preceramic heritage of food cultivation, popping, pit-roasting, and steaming, extended into what we call the borderlands, generating one of many traditions that contribute to Tucson’s designation as a UNESCO City of Gastronomy. Along with Ensenada in Baja California, Tucson is one of two UNESCO-designated cities of food found within what many of us refer to as the desert borderlands. Although used in different ways by cooks and archaeologists, the term Mesoamerica refers to the subtropical and tropical regions that extend south from the desert edges of North America all the way to Panama. It is one of the four oldest primary centers of plant domestication in the world. The field research done by Columba and Zizumbo shows that the Mesoamerican diet was based on a series of crops—including corn, squash, beans, chile peppers, tomato, and tomatillos—that were integrated into an agroalimentary system called milpa cultivation. Corn provided carbohydrates and energy; beans were the principal source of protein; and squash seeds were the main source of fats, while chiles, tomatoes, and tomatillos supplied vitamins and minerals. At the time of the Spanish arrival, this system was complemented by other cultivated species as well as more than 70 wild plant and animal species. The diet was primarily vegetarian but one in which species like turkey, deer, wild boar, iguanas, a wide variety of insects, insect larvae, and worms such as the meocuilin (agave white worm) provided complementary sources of proteins and fats. Some of the most ancient methods for preparing foods included the popping of seeds on hot slabs, the use of three-stone hearths, earth ovens, cooking on embers, sun drying, and using deeply carved stones as vessels for fermentation. This diet most likely began with the consumption of ground grains; pit-baked agave heads and stalks; and fruits and seeds of mesquite, prickly pears, and oaks. Metates of stone were used for grinding foods, often followed by soaking them in water with ash. More than any other food, corn was the central component of the Mesoamerican diet. Early varieties of wild corn roasted directly in embers produced popcorn. Pinoles were made by roasting and grinding corn kernels, dried beans, and other seeds into fine powders. Diluting these ground substances with water produced the earliest versions of what we now know as atole, a thick porridge-like drink. Soaked overnight in water, ground into a paste, and mixed with salt and chile, this drink was traditionally called atole blanco and frequently consumed with roasted squash or agave. For atole agrio or sour atole, the kernels of black corn were soaked for several days until they acidified and then mixed with panicle, a powder made from the seeds of a wild squash. For this beverage, the corn was washed with ash to remove any bitterness, sun dried, roasted, and ground with a little salt. 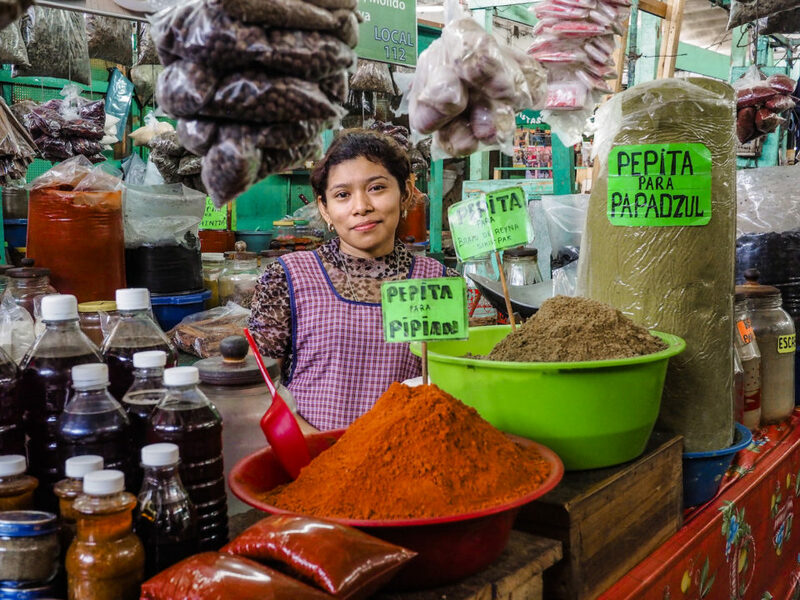 Ground grains were also mixed with fermented fruits to make beverages like tepache and tesguino, the fermented beverage originally made from corn masa and ground, cooked agave pulp. At some point, the alkaline-based process of nixtamalization became an integral part of the Mesoamerican diet. Nixtamalization refers to cooking and soaking dried corn kernels in lime water or ash to loosen the hulls and soften the corn for grinding. The structure of the corn changes, freeing up the nutritionally rich niacin and the amino acid tryptophan so they can be more easily absorbed. By balancing the amino acids, more protein from the corn is made accessible. Once ground, the corn becomes pliable dough called masa and is used for making tortillas and tamales as well as other South American foods like arepas. An astonishing range of shapes and flavors of tamales can be found across Mesoamerica, some baked, some steamed. Bean tamales, a Mesoamerican classic, were made by stacking multiple layers of corn masa and beans and wrapping the mixture in large leaves of arbol del tamal. Tamales de ceniza were made by soaking corn overnight in water and adding the wood ashes of the tepame tree, an acacia. Perhaps this was the historical antecedent to nixtamalization. 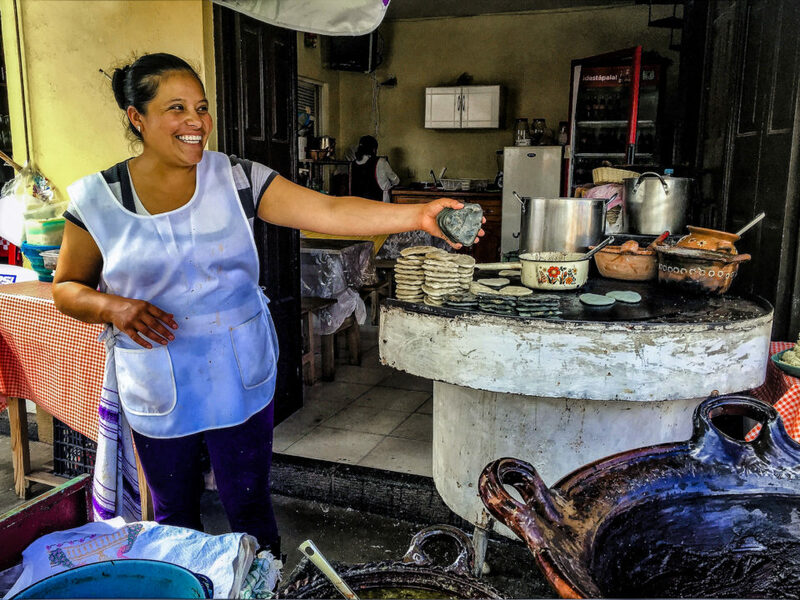 A variety of tortitas are sold at the El Tlecuil food booth at a market in Tepoztlan, Mexico. Mesoamerican ingredients include wild greens (quintoniles), jicama, Jamaica flowers, rose petals, squash blossoms, chia gorda, squash seeds, sunflower seeds, corn, agave flowers, and grasshoppers. Clearly, corn was the central ingredient in the Mesoamerican diet. The packaged corn tortilla found in supermarkets today bears little resemblance to the Mesoamerican corn. Mexican farmers continue to grow more than 40 distinctive varieties of maize of varying kernel sizes, textures, colors, and growth characteristics, each of which is represented by many more place-based varieties. In contrast, most corn masa that is prepared in the United States and much of Mexico is made from hybrid corn under the Maseca label. Estimates calculate that over 90 percent of the field corn (but not sweet corn) grown in the States is genetically modified and much of the corn consumed in Mexico is either bought from the United States or potentially contaminated by it. Even in Mexico, restaurants and stores that nixtamalize non-GMO corn and then daily prepare their own masa are rare. To our knowledge there is only one masa harina prepared from non-GMO corn on the market in the United States (Bob’s Red Mill). Corn is but one element of the Mesoamerican diet. With time, distinct ethnic and regional variations of this basic diet appeared in the cuisine of the Maya of Yucatán, the Aztecs of central Mexico, and the Zapotecs of Oaxaca. The introduction of an even greater variation of foods and ingredients by cultures from around the world contributed to what we think of as the Mexican cuisine of today. 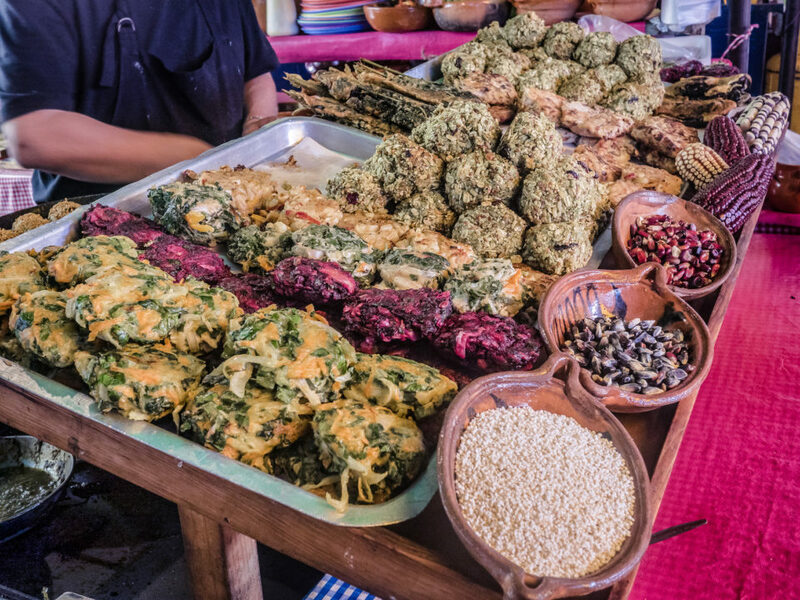 Reintroducing elements of the Mesoamerican diet begins with the preparation and consumption of foods that are relatively free of saturated fats, refined sugars, and overly processed flours. That’s where the many chefs and home cooks who work with Colunga and Zizumbo come in. Their process of exploring, reviving, or adapting nearly forgotten food cooking techniques has been called ecoculinary restoration. Of course, north of the Mexican border we have seen parallel interests emerge among indigenous chefs and others of mixed ancestry. 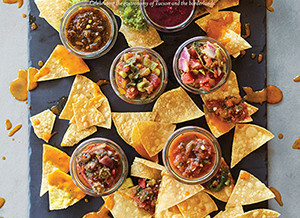 For decades, innovators and educators have been exploring foods that include both Mesoamerican and Native (North) American ingredients, as well as traditional preparation techniques. Tlacoyos made from blue corn masa, stuffed with potato, in Chignahuapan, Tlaxcala, Mexico. In Sonora in particular, at least a half dozen well-known chefs have been hosted by Seri Indian cooks to explore fresh ways to both revive and innovate their cultural community’s traditional foods. These visiting chefs have encouraged several Seri village cooks and caterers to promote not just their native foodstuffs but traditional cooking techniques for use in intertribal feasts and cultural exchanges. One such feast of local foods occurred in Punta Chueca, Sonora, in February of 2017. More than 60 native leaders of Seri, Yaqui, Mayo, Guarijio, Tarahumara, O’odham, and Mayan ancestry sampled cholla cactus fruit, fish, shellfish, and other foods prepared for them by Seri caterers, following workshops on the value of such foods for diabetes prevention, food sovereignty, and biocultural conservation. Over the last two decades, at least 400 Seri individuals have been locally trained, mentored, and supported in gaining at least part of their annual wages from conserving, sustainably harvesting, monitoring, preparing, and promoting these diverse foods. These activities are now one of the three most important income-generating activities in their communities. Closer to home, many wild and cultivated foods from Arizona are also undergoing renewed use by indigenous communities, such as flint corn pinoles by Ramona Farms in the Gila River Indian Community, to mesquite pod flour processed by the San Xavier Co-op Farm of the Tohono O’odham. Cholla buds and Pima lima beans are among the many native foods being eaten in these communities. These foods are also part of health education and diabetes prevention programs that will help keep today’s children from suffering from diabetes and obesity as they become adults. To be sure, there is no clear formula to reclaiming the Mesoamerican diet, or any other traditional cuisine. Each community does it in its own way. More than anything else, Colunga and Zizumbo remind us that the original inhabitants of Mesoamerica found means to be nourished by a diet that they describe as “diverse, nutritious, and balanced in its composition.” They urge us all to do the same.